While millions of Elvis fans fantasized what it would be like to know "The King", Jeanne LeMay Dumas lived that dream. As Miss Rhode Island, Dumas met Miss Tennessee - Linda Thompson - at the end of the 1972 Miss USA Pageant. The two formed an instant and lasting friendship...one which saw Jeanne become a regular part of Elvis' inner sanctum as she experienced an unforgettable four and a half year odyssey! During the 1980s on the TV, there was a television movie called “Elvis and the Beauty Queen”. Being an Elvis fan, I immediately spotted it on the TV program, and when I saw it was Linda Thompson’s story of the years she spent with Elvis as his girlfriend living at Graceland, from 1972 to 1976, after Elvis had separated from Priscilla, I made sure that I watched it, and I really enjoyed it. 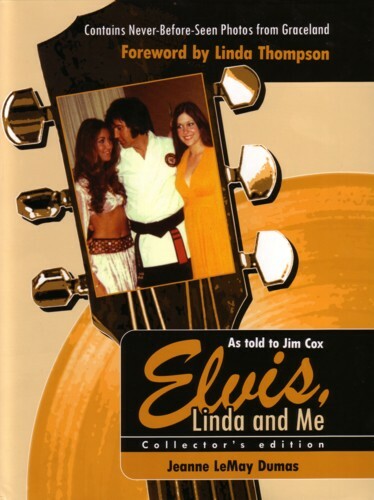 Recently, I had the opportiunity to read Jeanne LeMay Dumas’ book “Elvis, Linda & Me”. Jeanne privately published this book herself, but now has a publisher (Rooftop Publishing) and the book is available from online book outlets including Amazon. Rooftop Publishing has released Jeanne's book in two editions, a "Collector's Edition" hardback and trade release softcover. The front cover is eye catching with its light orange background and a photo of Elvis, Linda Thompson and Jeanne in the middle of it. Jeanne is Linda Thompson’s best girlfriend and this is her story about how she and Linda met when they were room mates at the Miss USA Beauty Pageant in Puerto Rico in May 1972 (Jeanne as Miss Rhode Island and Linda as Miss Tennessee) and then not long afterwards, how they both met Elvis Presley in Memphis. It is the story of the movie “Elvis and the Beauty Queen” but with Jeanne telling the story. Today, Jeanne and Linda are still close friends and talk regularly on the telephone, Linda in Los Angeles and Jeanne in Rhode Island . They continuously tell each just how lucky they were to have known Elvis Presley and to have shared those years with him. At the beginning of Jeanne’s book, there is a foreword by Linda Thompson, who herself encouraged Jeanne to write it. There were real girlie things to read about – what it was like to be part of a big beauty pageant like Miss USA (my daughters and I love watching the Miss USA and Miss Universe pageants on the TV); talk about boyfriends (would Elvis really like her); what to wear on an important date (with Elvis); sharing an apartment together in Memphis, and so on. I found the book so easy to read; the sort of book I couldn't put down. It is 142 pages long so didn’t take long to read. It is as though Jeanne is on the phone or chatting over coffee with me to tell me her incredible story. As I read, it was as though I was there with her, and feeling all the emotions which she was going through. 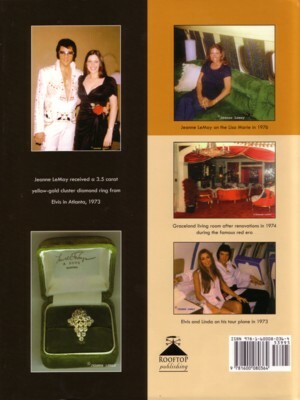 In the centre of the book are the photos Jeanne took with her little instamatic camera of Elvis, Linda and herself – in hotel rooms on tour with Elvis; Elvis live on stage; Elvis' automobiles; life at Graceland; and a series of very rare visuals of the mysterious, sacred upstairs rooms at Graceland (Elvis’ bedroom, bathroom and office), taken during a sleepover with Linda. Many of the photos highlight the colorful opulence of Graceland and among the other very rare visuals are external and internal visuals of Elvis' Monovale Drive residence in California. While several of Jeanne's photos have been published before, her visual archives of 70 color photos is an impressive collection, and one which will delight many fans. one evening at Graceland , Lisa Marie didn’t want to go to bed and asked Elvis if he would come up and sing to her. Elvis said ok, and should we let Jeanne watch us say our prayers first? Lisa and Elvis knelt beside Lisa’s bed to say their prayers while Jeanne and Linda watched at the door, and then Elvis sang a lullaby to Lisa while she went to sleep – how very special that was! Jeanne is invited to go on tour with Elvis and Linda. At the Nashville concert, Elvis introduces Linda and Jeanne to the audience, throws Jeanne a scarf (which she still has) and asks her what song she would like him to sing. She chooses George Harrison’s “Something” and when he sings it, it is like he is singing to her alone (and as Jeanne says, every female in the room would have been feeling exactly the same way). ** Jeanne worked for Vernon in his office for about 2 years from 1974. Vernon was fair but strict, easy going and low key, a nice smile, capable of genuine warmth and loved a good joke. But in 1976, Vernon changed from his light-hearted self due to things going on in his own life. He snapped and belittled them. One day, when his temper was aimed at Jeanne, she told him she couldn’t work for him anymore and left. The same thing has happened to me, and I told my boss I couldn’t work for him anymore. ** Jeanne is a Pisces with perceptive abilities and so am I.
Jeanne meets Linda Thompson at the Miss USA pageant in Puerto Rico in May 1972. They are room mates and click straight away. Linda persuades Jeanne, who lives in Rhode Island , to come to Memphis and share an apartment with her and get a job there which Jeanne does. When Jeanne first arrives in Memphis , Linda shows her around, and of course, the first place they go to see is Graceland , to peer through the music gates up to the house on the hill. They go to lunch at a restaurant where Linda runs into friends, one of whom asks if they’d like to meet Elvis and if so, to be at the Memphian cinema that night at midnight . They do, of course! Elvis walks into the cinema and sits down. Linda calls out to Elvis who is wearing a black cape with red lining: “We’re looking a little like Dracula tonight, aren’t we?” Jeanne wants to sink through the floor, but Elvis is immediately attracted to Linda and comes to sit with them. He invites them to come to Graceland the next night so that he can show them around which they do! Elvis invites Linda to come to rehearsals in Los Angeles with him, then on tour with him, and after that to move into Graceland. Linda becomes his constant companion for the next 4 to 5 years. Jeanne is not forgotten. She goes back to Rhode Island to live, but then Elvis and Linda constantly invite her to tour with them; have Christmas at Graceland with them; Linda invites Jeanne for a sleepover at Graceland while Elvis is in Los Angeles finalising his divorce to Priscilla. They sleep in Elvis’ bed upstairs; go on shopping trips; and have a wonderful girlie time! Jeanne cannot believe all that is happening to her. Linda and Elvis then ask Jeanne to work in Vernon’s office at Graceland answering fan mail after Becky Yancy leaves. The job is 9 to 5, with an hour for lunch. Perks of the job are being able to swim in the pool at lunchtime, and helping herself to coffee and food which the maids kept available all the time in the kitchen! But as time goes on, Elvis is becoming more and more dependent on the presciption drugs and it changes him. In 1976, he begins seeing other women and then meets Ginger Alden whom he starts dating. Linda finally moves out of Graceland and goes to Los Angeles , where she marries, has 2 sons, and becomes a very successful songwriter and actress in TV shows. Jeanne moves back to Rhode Island and is now happily married. On 16 August 1977, Jeanne is at work where she is a hostess supervisor at a popular restaurant when her sister rings with the news that Elvis has died. Jeanne, like the world, is in shock. Lisa Marie has rung Linda in LA with the news too. Linda tells Jeanne not to come to Memphis for the funeral – that people are being turned away, somany want to come and it is a mess. Jeanne tells herself that it doesn’t matter – that Elvis is gone, that she “would never again be able to talk to him, or hear his rich, beautiful voice in person, or watch him perform like no other performer I’d ever seen”. In their regular phone calls, Linda and Jeanne tell each other how blessed and lucky they were to have spent those years with Elvis Presley, a fun loving, very talented person who changed the world. There is so much more in this book that I haven’t the space to tell you. You will have to read the book for yourselves. The "Collector's Edition" of Jeanne's book has a recommended retail price of US$39.95. Apart from being a durable hardcover with dust jacket, it differentiates itself by featuring 70 full color photos while the softcover release contains 30 color and black & white visuals. The softcover edition has a RRP of US$22.95. However, substantial savings can be made by buying the book through Amazon. Jeanne is scheduled to be in Memphis during Elvis Week 2007 including as guest speaker at one of the two Elvis World luncheons (now sold out!). Verdict: I recommend Elvis, Linda and Me as a very enjoyable read. It offers us never before seen photographs from Elvis' inner sanctum and Jeanne's delightful narrative provides the reader with a different and very interesting perspective about life around Elvis. As to which edition to buy, I strongly favor the "Collector's Edition", as it offers superior value for money. The 70 full color photos are priceless!